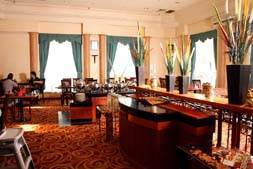 TravellerS Hotel Jakarta is a three star hotel at Jakarta. Located just a few minutes away from the bustling China Town which is renowned for its variety of shops and choices of food. Close from the most authentic Jakarta’s district and entertainment area, Kemayoran exhibition centre and the famous Ancol Dreamland and Sea World of the city. Easy access, just 8 minutes from and to Ancol toll's gate and 25 minutes drive from International Airport, Soekarno-Hatta. To be the best 3 (three) stars hotel in the region choose by the customers and employees with the excellent services and management and to be a profitable hotel while ensuring customers comfortable and satisfactions in all hotel areas. 1. Practicing "It's the extra thought that makes the difference"
4. Improving good communication :"Communication is the key to success"
we offer special services and amenities designed to cater to your unique business needs. Close from the most authentic Jakarta's district, entertainment area, Kemayoran exhibition centre and famous Ancol Dreamland and Sea World. Easy acces, just 8 minutes from and to Ancol toll and 25 minutes drive from International Soekarno-Hatta Airport.